Let’s face it: Many homes today feature inadequate, poorly positioned, and sometimes plain-old ugly light fixtures. But you don’t have to live with anything you don’t love, especially when so many ceiling-mounted and hanging fixtures can be found on the market. 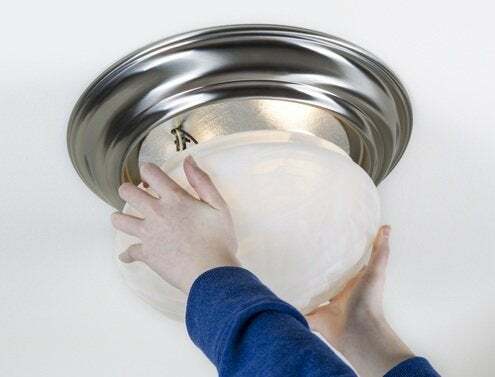 Since new ceiling light fixtures come with mounting hardware, replacing an existing unit is easy—even for the novice do-it-yourselfer. Turn off electricity to the room at the main circuit breaker panel. Double-check that power has been cut by locating and testing the light switch that controls your ceiling fixture. Next, carefully unscrew and remove the canopy of the old fixture. With the junction box visible, remove the wire nuts and separate the supply wiring from the old fixture. Carefully examine the wires for damage, and if none are frayed or broken, leave the wires exposed for the new fixture. Most hanging lights have a supporting chain or cable, through which (or next to) the wires should be threaded (or hung). I recommend using the paint tray of your stepladder to prop up the fixture, while you feed its wires up to the junction box. 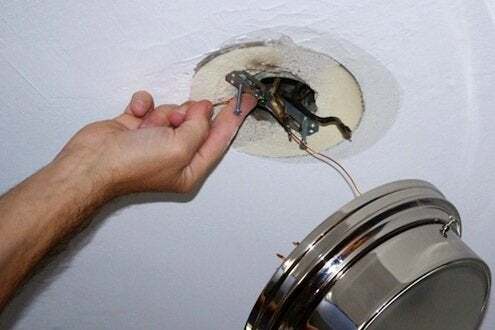 Carefully guide the fixture wires through the canopy, ceiling plate, and hanging bracket of your new fixture. Strip about a half-inch off of the fixture wires and about a half-inch off of the supply wires. Most new fixtures are color-coded with black and white wire. Twist together the stripped, bare end of the fixture’s black wire with the stripped, bare end of the supply line’s black wire. Secure the connection with a wire nut, then repeat the process with the white wire. Many fixtures also have a bare copper or green-sheathed ground wire, which should be twisted onto the mounting bracket’s copper or green grounding screw. Now carefully tuck the wires into the junction box, put a bulb in the fixture, and turn the circuit breaker on. If the light works, that means your wiring connections have been successful. Before continuing, turn the circuit breaker off again. Screw the ceiling plate to the mounting strap or support rod, then put the mounting stem onto the ceiling plate. At this point, make sure that the installation is secure and that the fixture is hanging at the proper height. (If the chain is too long, you can remove links or loop the extra chain around the mounting stem.) Slide the canopy into place so that it covers the mounting hardware; tighten the locknut to hold the canopy in place. Finally, install the correct bulbs, turn the electricity back on, and admire the radiance of your new ceiling light fixture!